While clients refer to someone who looks for or uses professional service from the service provider (i.e. professional such as lawyer, doctor, chartered accountant, consultant, etc.) and pays a fee for the same. On the contrary, Customers are the one who is going to buy the product from the shop or business. He/She is someone, with whom the company deals and is considered as the king of business. In the business world, you might have frequently come across the terms customers and client, that are commonly juxtaposed by the people. However, the fact is they are different in the sense that the firm offers both tangible and intangible products to customers, but only intangible products are offered to the client. 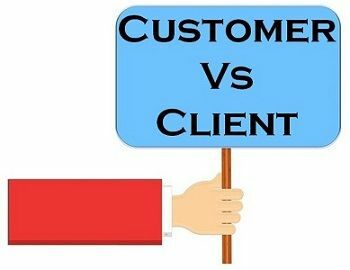 So, take a read of the given article to understand the difference between customer and client. Meaning Customer means a person who buys goods and services from the company. A person who looks for professional service from the business is known as a client. Engages in Transaction with the company. Fiduciary relationship with the company. We define a customer as a person who purchases the goods and services from the business, in exchange for monetary consideration. The term customer is derived from a Latin term ‘custom’ which simply means ‘practice’. In other words, the term customer means a person who is habitual of buying the goods frequently. In general, there are two types of customers, i.e. intermediate customers like those who are engaged in purchasing goods with the purpose of reselling them and the ultimate customer, the customer who are the end user (consumer) of the product or those who delivers the product to the final consumer. Customers are considered as the king, in any business as they are going to reap profits for the organisation. They are the one who decide whether the product or service are up to the mark or not. The term client refers to the party, who has business dealings with the organisation. He is someone, who is the recipient of services. First of all, the client enters into an agreement with the organisation; that results in a fiduciary relationship between the parties. If the client is satisfied with the services provided by the professional, the temporary relationship may turn into a loyal and long lasting one. Normally, the client looks for professional service, skill or advice of the service provider, such as legal services provided by the lawyer, the services of a chartered accountant, consultant, insurance agent, advertising agency, fashion designer, interior decorator and so on. Sometimes long term customers are also termed as clients. A person who purchases goods and services, from the company is known as the Customer. Client refers to someone who seeks professional services from the company. There exist an agency agreement between the client and the service provider. Conversely, there is no such agreement between the customer and the business entity. The customer engages in a transaction with the company whereas the company and clients are in a fiduciary relationship with each other. A company focuses on selling the product and services to the customer. On the other hand, the company focuses on serving the client. The company offers goods and services to its customers. Talking about clients, who seek for professional services like advisory, legal, consultancy and may more. The degree of personal attention required in case of the customer is less as compared to the client. A relationship between customer and business exist for a short term only. However, a customer can have repeated transactions but only for a limited time. In the case of a client, the business engages in a long-term project with the client. The main difference between the words customers and clients is in the terms selling and serving. There are many instances that can make you think that these two entities are different. As for example, a company has the client of United States, to whom the company serves its professional services and at the same time the company offers and sells its products to the customers of different parts of the world. Both are very important part of the organisation as they help the organisation to grow and flourish in the long term. The business should make products as per the demands of the customer and provide services according to the client’s requirement. This will prove helpful for the company to retain old and existing or new customers and clients. Great text! The idea of presenting a comparison table is parcticularly good!! Nice explanation of differences between Customer and Client. Like it!!! The differences are clear. Actually a brilliant article.